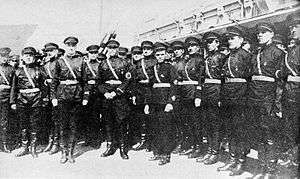 Fascism had existed amongst the Manchurian Russians since the October Revolution and had been promoted by the minor Russian Fascist Organisation amongst others. A secret convention of the various groups was held, leading to the foundation of the RFP under the presidency of Major General Vladimir Dmitrievich Kozmin. Konstantin Rodzaevsky became Secretary General of the party's central committee on May 26, 1931, becoming the de facto leader of the party. Adopting the slogan "God, Nation, Labour" and publishing the journal Natsiya, the party called for Italian-style fascism to take advantage of the shaky position of the Bolshevik leaders in the face of both external and internal opposition. By cooperating with Japan, the RFP became the most influential émigré group in Manchukuo, setting up a party school in Harbin in 1932. Rodzaevsky also assisted the Imperial Japanese Army in the formation of the Asano Detachment, the all ethnic Russian special forces in the Kwantung Army, organized for carrying out sabotage against Soviet forces in case of any Japanese invasion of Siberia and Russian Far East areas. The party also developed close links to like-minded groups in the United States, including Anastasy Vonsyatsky during his exile. 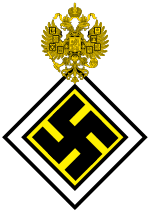 On March 24, 1934 a merger was agreed in Tokyo between the RFP and Vonsyatsky's supporters (who also used the label All-Russian Fascist Organisation), although they would later clash over Rodzaevsky's attempts to accommodate more conservative Russians, as well as his anti-Semitism, which Vonsyatsky rejected. Eventually the RFP broke with the Americans, and in 1935 Vonsyatsky was expelled, breaking off to form a more minor movement in the United States  called "Russian National Revolutionary Party", which was of anti-communist orientation and claimed that their only intention was "to form in Russia a truly democratic government". Nevertheless, the RFP under Rodzaevsky had grown strong and claimed 20,000 activists by May 1935. Subsidiaries of the RFP were set up - Russian Women's Fascist Movement (RGFD), Fascist Union of Youth, Union of Young Fascists – Vanguard (boys), Union of Young Fascists – Vanguard (girls), Union of Fascist Little Ones. 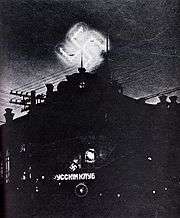 Rodzaevsky's book, The Russian National State, outlined the programme of the party to establish fascism in Russia by May 1, 1938, including a desire to get rid of the Jews, indicating a strong break from the Vonsyatsky-wing. The party also had a strong commitment to the Russian Orthodox Church, promising a special relationship between the Church and the state in his projected fascist Russia. The group also promised to respect the traditions of Russia's nationalities and instigate corporatism. From 1940 to December 1941, there was a resumption of cooperation between Konstantin Rodzaevsky and Anastasy Vonsyatsky, interrupted by the start of Japanese-American War. When war was declared, the activities of the RFP outside Manchuria slowly came to an end whilst the group was restricted by the Japanese following the Soviet-Japanese Neutrality Pact of 1941. The group came to an end in 1945, when the Red Army invaded Manchukuo in the Soviet invasion of Manchuria, with Rodzaevsky eventually surrendering before being executed the following year. Stephan, John J. (1978). The Russian Fascists: Tragedy and Farce in Exile, 1925-1945. Harper Row. ASIN: B000H5X5NM.